Enjoy the music of Orlando y Teresa as we take you on a fabulous cruise through the rich flavors of the various Latin American countries and their particular rhythms and sounds in music. We play a wide variety of song from places such as Argentina, Bolivia, Chile, Colombia, Cuba, Ecuador, Mexico, Spain and more. You will hear the classics of these countries along with original works by Orlando Castro, BMI award-winning songwriter, with a touch of Latin Jazz and Romantic Lyrics. As part of the ensembles of Ovation Music Productions, we offer our services for private parties, weddings, and community & senior centers. 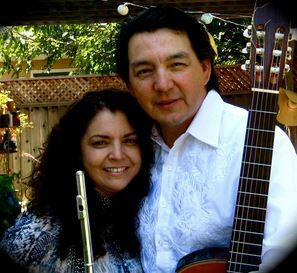 Our music is a rich blend of originals and the great Latin American classics.